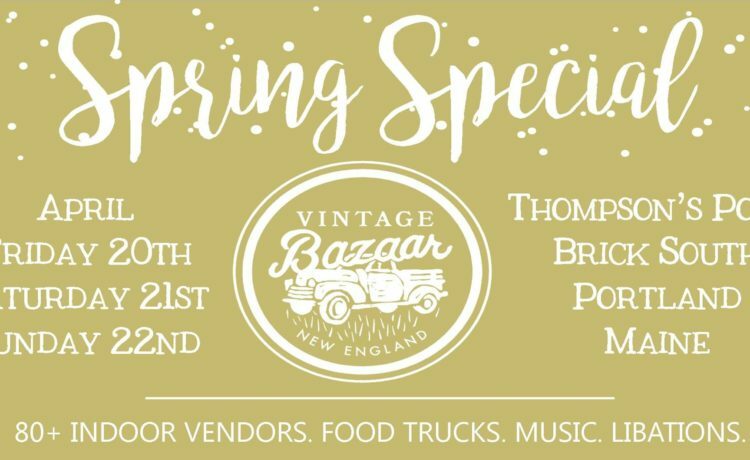 Vintage Bazaar New England – SPRING SPECIAL comes to Portland, Maine!! Let’s kick off the coming 2018 spring season in Bazaar Style! Join us for a 3-day Vintage Bazaar you won’t soon forget. April 20th, 21st and 22nd (indoors) at Thompson’s Point in Portland. Approx 80 talented vendors from across the country, spread inside a historic 25,000sqft brick industrial building, will offer thoughtfully decorated and curated booths with exceptional vintage treasures, upcycled salvage styles and unique handmade items. It’s been a long winter…come put some “spring” in your step with us! Vendors will be offering lots of spring inspired items for your home and garden. There will also be food trucks, music, libations and a vintage-inspired photo booth. Stay tuned for additional information, special guests and much more!